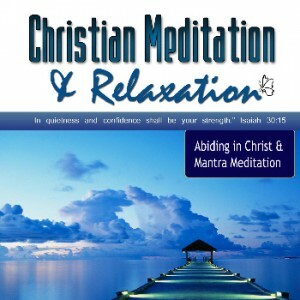 CD includes the two meditations, MANTRA MEDITATION and ABIDING IN CHRIST. Each meditation begins with a progressive relaxation, followed by a Biblical narrative and relaxing background music. The mantra meditation is one of the most simplified meditations of all. A mantra can be a scripture or biblical word or phrase that you focus on during the meditation. Mantra meditation is great for bringing peace to your mind and learning to control your thoughts. This meditation begins with the mantra meditation “The Lord is my Shephard I Shall Not Want,” however you can substitute for your own mantra. Mantras Examples: The Lord is my Shepherd, Jesus, Abundance, Peace Be Still, The Joy of the Lord is my Strength, Peace, Comfort, Guidance, Wisdom, The Lord Directs my Steps, and I Walk by Faith. “Do you ever just want to abide with Christ? You don’t want to ask for anything or even say a word, you just want to be near your Saviour. Jesus stands at the door of each of our hearts waiting to be invited in. Open the door and dwell with him.